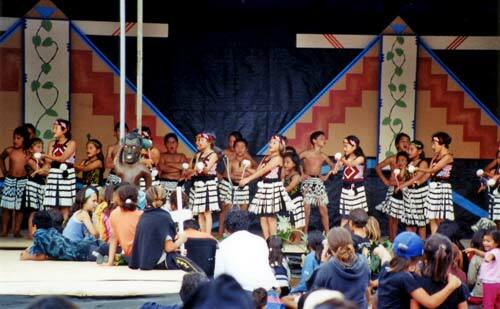 These children from Waimana School are performing at Te Hui Ahurei a Tūhoe at Rūātoki in 2003. Tūhoe are a young people: in 1996, 42% were under the age of 15. One of the challenges facing the tribe is maintaining Tūhoe identity among younger members, most of whom live in urban areas away from Urewera. The festival Te Hui Ahurei a Tūhoe, established in the early 1970s, has a crucial role in connecting young Tūhoe people to their culture. Held every two years, it now attracts more than 25,000 people. Participants enjoy activities as diverse as netball, debating and the creation of wearable arts.